Women may be blazing trails to corner offices and government seats, but there is another industry, far away from the corporate world, where women are also making their mark: the vineyard. The world of wine is a traditionally male-dominated industry, with some old-world wineries dating back as far as 26 generations to the 14th century and beyond. And while feminism may have made leaps and bounds of progress since the wine world's inception, evolution isn't always fast-paced, especially in settings where traditions are cherished and passed down, unchanged, from generation to generation. 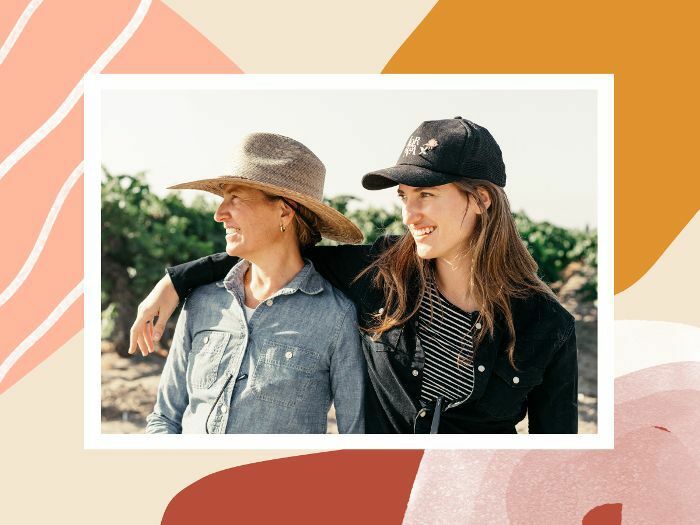 But just as successful women are breaking glass ceilings in boardrooms everywhere, a trailblazing group of female winemakers is paving the way for future generations of women in wine—though they would probably dislike being labeled as such: "First and foremost, we are all winemakers," Kerith Overstreet, proprietor of Bruliam Wines told MyDomaine. "We're not just female winemakers but awesome, talented, hardworking winemakers, whose wine stands tall because it's damn good wine, whether crafted by a man or a woman." Ask women in any male-dominated industry their experience in forging a path for women, and you're likely to hear a lot of anecdotes and vastly different stories—some good and some not so great. According to these talented winemakers, the wine world is no different. Some women have been blatantly refused service by sales representatives, while others have just had to prove themselves a little harder. But at the bottom of it all, one thing is crystal clear: There is a supportive and diverse growing sisterhood of women making great things happen in the wine world. Meet the women who are making it all happen. Who: Alessia Antinori was born to be a winemaker. Her family's winemaking history dates back 26 generations to 1385 in Italy's Tuscany region. "My sisters and I grew up in Florence watching our father run the company and its various properties, and my earliest memories are in the vineyards of Chianti Classico and Bolgheri during harvest." Her Story: Antinori studied viticulture at university, also learning from her family's rich history along the way: "I'm very lucky to call my family members my mentors, beginning with my grandfather, who would bring us into his office when we were children to teach us the accounting side of the business," she told MyDomaine. Her mother is also involved in the business, specializing in organic and natural wines. Her Experience: "My sisters and I have been fortunate to mature into our family's business during a time in which we've had many women prove themselves capable of extraordinary work in wine," she says. "In my father's time, things were a bit different." For Antinori, wine is a personal art form reflecting the people who made it: "I think women can bring a certain kind of patience and respect for results over a long period of time—which is very important in wine." Her favorite wine: "Tignanello, our classic, signature wine," she says. "My father developed this wine in the 1970s as our own answer to the Bordeaux blends. It was the first Italian Sangiovese to be blended with cabernet sauvignon. It is a bold, beautiful wine—still respected and revered the world over today, and we're very proud of it." Who: Corinne Comme got her start in winemaking with her husband, Jean-Michel, after her losing her mother-in-law in 1997. "We were determined to not only continue her work but to understand life itself," she told MyDomaine. "We were a bit naïve because making wine is much more than just the techniques of farming and winemaking. We had to educate ourselves on the market and the commercial world." She is now the owner of Château du Champ des Treilles in Bordeaux, France. Her Story: Comme studied as an engineer in food science and technique in Bordeaux and worked in the agro-food industry for several years. But after the birth of her children in 1990 and 1992, she and her husband re-evaluated their life. "We took over Jean-Michel's grandfather's family vineyards in 1997 and began practicing our wine philosophy based on biodynamic practices." Her Experience: The wine industry isn't always an inclusive space for women. "Some sale representatives for vineyard and winery products do not assist me. They insist that my husband must be the one purchasing and running the estate," she told MyDomaine. "Needless to say, they do not receive my business. The workers are sometimes a bit challenging also, as they do not respect me. It requires some extra effort to be taken seriously." Her Favorite Wine: "Cabernet sauvignon from the Médoc region of Bordeaux. Because of the terroir, it is well balanced, complex, and elegant," she says. "The blending techniques express the beauty of the complexity of the terroir, which makes the wine more than a drink—it's an experience of emotion." Who: Melinda Kearney and Michele Ouellet are the mother-daughter duo behind Lorenza Rosé, hailing from Napa Valley, and wine has always been a part of their lives. Kearney joined the wine world in 1990 with a small producer of chardonnay and pinot noir. "I wore a lot of hats, from cellar and vineyard work to bookkeeping and sales calls," Kearney told MyDomaine. Her daughter, Michele, fell in love with rosé after spending summers in Paris while modeling. In 2008, Lorenza Wine was born. Their Story: "When we first started Lorenza in 2008, people were a little dubious of two women making low-alcohol, pale-pink rosé, which was not on trend," says Ouellet. "We were ahead of our time, so we had to trust our gut and stick to our passion. I've enjoyed proving that rosé is not just for girls. Yes, it's fun and pink, but it is for everyone, all year round." Their Experience: "Like in most businesses, women have had to deal with inappropriate behavior," shares Kearney. "In the early 1990s, women in the wine business were few and far between, so I was dealing with mostly men, and while for the most part, there was mutual respect, I had the feeling of being an outsider." Having come of age in the wine industry a couple of decades later, Ouellet already has had a more positive experience: "I think we've passed a point where women need to be categorized as female winemakers," she points out. "Some of the best wines in the world are made by women. They deserve to be celebrated equally because of the quality of the wine, not just because they are women." Their favorite wine: Kearney loves drinking pinot noir. "The complexity of this varietal reveals beautiful layers of aroma, flavor, and texture," she says. Ouellet prefers grower champagne, Riesling, and crisp, refreshing white wines from Northern Italy. Who: Margo Van Staaveren has worked through 38 harvests at Chateau St. Jean in Sonoma County. She was named Winemaker of the Year by Wine Enthusiast magazine in 2008. Her Story: Van Staaveren graduated from the University of California at Davis with a BS degree in fermentation science. "It doesn't sound exciting, but it's the foundation for a solid understanding of how we move grape to glass." She joined Chateau St. Jean as a laboratory technician shortly after graduation and worked her way up to a position as director of luxury winemaking for Treasury Wine Estates, Chateau St. Jean's parent company. Her Experience: "I have never felt that being a woman has presented any disadvantage of any kind," she told MyDomaine. "Winemaking is very much a meritocracy, where you can be recognized and rewarded for your efforts no matter if you are a talented man or an equally talented woman. The women winemakers I encounter and work with never say anything like 'I want to be the best female winemaker.' They just want to be the best." Her Favorite Wine: "Each Valentine's Day, my husband, Don, also a winemaker, knows me well enough to bring me not a dozen red roses, but a dozen red wines, my favorites of the moment," she told MyDomaine. "For a while now, I've been exploring what we call a GSM, which is a blend of grenache, syrah, Mourvèdre. California's Central Coast boasts several very interesting examples, and many come from the Rhône Valley in France." Who: Valérie Vialard discovered wine at a very young age. "My grandfather owned a parcel of vines in Bordeaux, and because of him, I grew passionate about wine." Her career brought her to Château Latour-Martillac in Bordeaux. Her Story: Her scientific studies in school led Vialard to a career in oenology, where she met her husband, Gabriel, an oenologist and technical director of Château Haut-Bailly. Through impactful apprenticeships with Michel Dupuy of Château de Fieuzal and Christophe Ollivier's wine consulting team, she was able to shape a successful career as a winemaker. Her Experience: "When I was appointed as cellar master for Château Latour-Martillac, I had to work hard to win the respect of the all-male team," she told MyDomaine. "They had never been led by a girl." She points out that though more than 50% of oenology graduates were women, very few of them are actually making wine. Her Favorite wine: "I prefer a blend than any single variety," says Vialard. "For white, I like Sémillon, which tempers the exuberant tart crispness that is sometimes characteristic of sauvignon blanc. For red, my favorite grape is cabernet sauvignon for the elegant fruitiness, the structure, and its potential of aging." Who: Pauline Lhote grew up in the Champagne region, so grape-growing and winemaking was a part of her life from a young age. "It was easy to fall in love," she says. "When I was 14, I told my parents I wanted to be a winemaker. I'm not sure how seriously they took it, because I was just a teenager. I knew I wanted to make sparkling wine specifically." Her Story: She focused her education on sciences like biology and chemistry to prepare for a role in the wine industry. She started out with an internship in rosé Champagne and has since relocated to Napa Valley, where she is the director of winemaking at Chandon California. She followed in the footsteps of Dawnine Dyer, the first female winemaker for Chandon in the 1970s. "Her work revolutionized sparkling winemaking for Northern California. When I came to Chandon California, I felt great pride in reigniting that torch, carrying forward a strong female legacy for the estate, which is such a strong, young, female-forward sparkling wine brand." Her Experience: "I grew up working on a farm with two older brothers, so navigating a predominantly male environment was not new to me," she told MyDomaine. "As a minority in this industry, both as a woman and because I'm younger than most in my field, it's especially important to be confident and assertive—to voice your point of view and to champion your ideas and vision." Her Favorite Wine: "I'm very partial to rosé. Sparkling rosé can sometimes be a bit heavier than still wines because it is made mostly from red grapes like pinot noir and Meunier. I prefer a rosé that is light and fresh, so I do something very unusual with the one I make at Chandon California. The blend is predominantly chardonnay, a white grape, of course, and I just use pinot noir to add a touch of red fruit character and color. It's delicious!" Who: When Kerith Overstreet was just a young girl, her father would tell her that she could be whatever she wanted—after medical school. "That's exactly what I did. In 2007, I left a career as a surgical pathologist to pursue her true passion: winemaking." Her Story: Overstreet went back to school to UC Davis and started Bruliam—the vineyard she named after her three children: Bruno, Lily, and Amelia—in time for the 2008 harvest. "That year I made a single barrel of wine—just 25 cases. Since then, we've grown significantly, and today I cherry-pick my fruit from the top vineyards in Sonoma County, including our home ranch in the RRV, Torrey Hill. I work with the best growers and consider my luck extraordinary." Her Experience: "I was once invited to a private wine tasting for a multi-year vertical for a prestigious Sonoma County Vineyard," she recalls. "When I entered the room, a gentleman asked me to bring him a glass of water. He assumed I was the waitress." She also points to the intrinsic camaraderie among Sonoma winemaking women. "I cherish my time spent with other female winemakers. My best friend is also an incredibly accomplished winemaker. She provides a safe space for me to explore my mistakes and mishaps, and she helps me make better wine every year." Her Favorite Wine: "I love pinot noir because the grape is so aromatically lifted, nuanced, expressive, and reflective of the site," she says. "Two pinot noirs from neighboring vineyards can taste wildly different since pinot is so deeply informed by minute deviations in terroir, climate, and soil." Who: As a child, Valérie Lavigne, Ph.D., was particularly attentive to all the smells and flavors of her environment. "I called upon my olfactory memory at every opportunity. I remember, for example, that I just had to go through our door to find out what my mother had prepared for the meal." Oenology was a natural fit for her abilities. Her Story: Lavigne's studies in the food industry led her to Bordeaux. "I did not know anything about oenology," she told MyDomaine. "My meeting with Valérie Vialard, today the oenologist of Latour-Martillac, was decisive. She wanted to enroll in the national oenologist diploma, so we visited the laboratories of the Institute of Oenology. I was fascinated by this discovery." Since then, she has become a prominent oenologist at the University of Bordeaux. Her Experience: "Very honestly, I have never considered or felt being a woman in the world of oenology as a handicap, quite the opposite," she explains. "My youth, at the beginning of my career, was, in my opinion, much more difficult to navigate in the cellars. Whether you are a man or a woman, the important thing in this business is to convince and reassure. From there, everything is possible and confidence is established. A touch of feminine charm is also never harmful, unless, of course, you run across someone who is a bit of a misogynist, which has only happened to me on very rare occasions." Her Favorite Wine: "As far as white wines are concerned, I have a particular fondness for the sauvignon blanc grape variety. But basically, I am not attached to this or that variety—I have a spontaneous attraction for fresh, aromatic, and savory wines. Above all, I expect a wine to tell a story, that of its origin and the people who shaped it." If these talented women are any indication, the wine industry is well on track to become an equal-opportunity industry—and we'll say cheers to that.